Bowing walls are a common problem in South Dakota. When rain and melting snow soak into the soil, added pressure can build up on your foundation walls, causing them to crack, lean, or bow. Poor drainage, poor waterproofing, and uncontrolled water can make the problem even worse. Any of these problems point to a need for foundation repair. 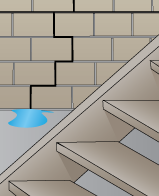 Contact Rapid Foundation Repair today for more information on how you can keep your home safe. In order to provide the best possible foundation repair services for your bowing wall repair, Rapid Foundation Repair offers helical piers, wall anchors, and helical wall tiebacks/anchors. Helical piers are popular products because of their ability to be installed in any weather conditions with a very little amount of equipment. These piers will quickly stabilize your foundation or porch and cause very little damage to the beautiful landscaping around your home.The effect of the installation is immediate, repairing your foundation and preventing future problems. Wall anchors are another solution to help with your bowing wall repair. Wall anchors are a tool that you can use so that you don’t have to replace a whole foundation wall. 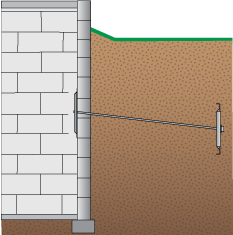 A wall anchor is a plate that is fastened to your basement wall with a rod going through the wall and into the soil around your foundation. This rod is connected to another plate that is inserted into the ground about 10 feet away from the basement wall. Monthly tightening of the anchor can slowly pull your bowing wall back into its original position. Helical wall tiebacks and anchors are another type of anchor that is installed very much like wall anchors, going through your wall and into the soil to give your bowing or leaning wall extra structural support. The pressure on the bowing wall is relieved through this process, and the anchor is used to straighten out the bowing wall. 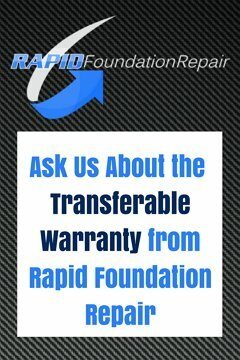 Rapid Foundation Repair will help you figure out the right choice for your unique situation. Our quality Earth Contact Products (ECP) tools, installed only by trained professionals, will ensure the safety o your family and the integrity of your foundation. Call us today for all your bowing wall repair needs.